1901 census at 10 Marchmont Crest, Edinburgh. He is a Law Clerk rooming there. 1914 Dec 7. The Cameronians (Scottish Rifles). 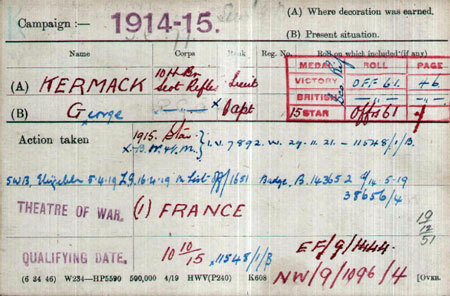 Temporary Lieutenant George Kermack, from a Reserve Battalion, to be temporary Lieutenant. 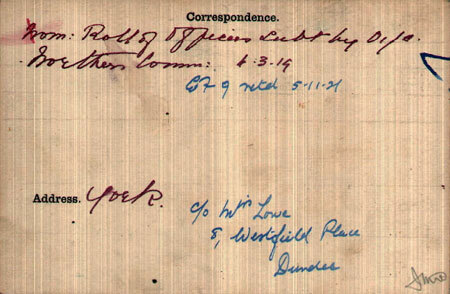 Dated 2nd October, 1915, but with seniority from 7th December, 1914. He appears to have been commissioned as a Lt rather than 2nd Lt.
1919 Apr 17 . Scot. Rifles. Temp. Capt. G. Kermack relinquishes his commission on account of ill-health caused by wounds, and retains the rank of Capt. 1920 Nov 10. Joined ADRIC with service no 1019. Posted to J Coy. 1921 Jul 7. "Permitted to resign on disciplinary grounds"
1922 - 1923 He appears as a solicitor in a number of Scottish Papers, but no mention of him after 1923. 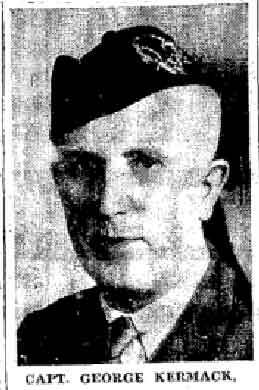 1926 Leaves UK for Canada. He is a Solicitor. His mother Mrs J A Kermack plus wife and 2 children are at 25 King Street, Stirling.. He is looking for a similar job in Canada. 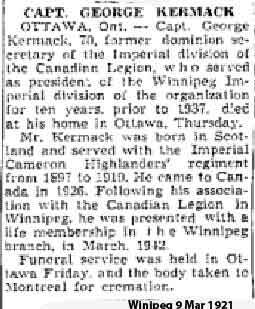 1937 Many press stories about his work with Canadian Legion.